Just the other day, I was a little girl all dressed in my Sunday best, including patent leather shoes, of course. Undoubtedly Mama had rolled my hair in pink sponge rollers the night before. As I sat waiting for the morning service to begin, to the left of me sat Grandma, to the right of me, Mom, and in front of me on the platform stood the man I admired more than anyone on Earth...Daddy. I used to call Daddy the "giblet preacher" 'cause God would give him little tidbits of wisdom to share before the main course of the sermon. I can remember many times, people would come up to tell my dad, "Thanks for sharing what you did, it's what I needed to hear today." Daddy wasn't a preacher, not officially, but his life spoke. It spoke to me as a child and it still speaks to me today. A daddy is a leader whether he wants to be or not. The way he walks, talks, and spends his time says volumes about what's in his heart. My daddy, without a doubt, has a heart of gold. What's the best thing about my dad? He loves Jesus. He made sure we were at church nearly every time the doors were open, but more impressive than that was that He acted the same at home as he did at church. He spoke at home the things he would speak at church. He was not playing a game...he was the real deal...a passionate follower of Christ! He pointed all four of us kids to Jesus in both tangible and intangible ways. If he ever heard us say anything contrary to the Word of God, he would talk to us about it. Many times, I would get up, walk in the kitchen, and see my daddy at the table or in the den studying his Bible. He made sure that in the house or in the car, Christian music was played. We watched "family friendly" shows on TV. We prayed together. If anything "unholy" crept into our lives, it came in stark contrast to the atmosphere that was allowed in our home. It made it hard for tiny consciences to chase rebellion. It's hard for evil to exist in a home saturated by the presence of the Lord. I even grew up with a portrait of "Jesus" hanging on the wall in our den. Jesus was always watching me, and so was Daddy. I was aware of the presence of both. Daddy did all the things a great man does. 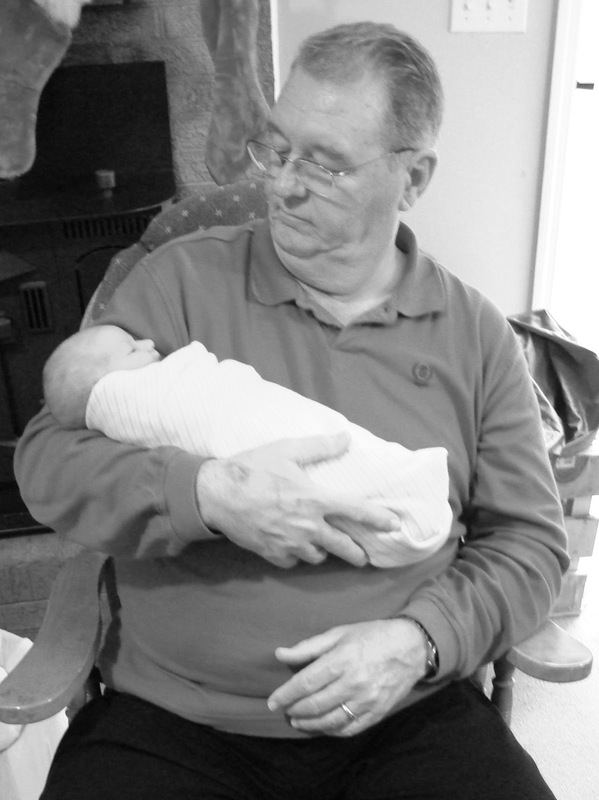 He worked hard to provide for our family and he devoted his life to his place of employment. He stayed after work many times, not because he had to but because he knew there was a job to be completed. He worked with excellence in mind. If he was at home working in the yard, I saw excellence there, too. Whatever he did, he did it as unto the Lord. Daddy also was and is a protector. When I was little, he made sure my bike was working right. When I was older, he was always checking on my car. If I was out late at night, he would be waiting up, half-asleep, when I walked in the door, just to make sure I got in okay and that all the doors were locked before bed. Even today, we joke that my dad is the "weather man". If bad weather is headed our way, you can bet my daddy knows about it. If it's really bad weather, you can bet the phone is going to ring. If there was a corny joke to be told or humor to be found in a situation, I could always count on my dad. I wish I had a dollar for every time he has cracked me up over the years. Since laughter is like good medicine, there's no doubt that I had a healthy childhood. It was my mom who woke me up for school during the week (which is a whole other story), but on Sunday mornings many times my Daddy took on the chore. Waking me up can sometimes be like trying to wake the dead, so Mom, bless her heart, needed a rest. Daddy would come in the room, snuggle up next to me, and throw his big ol' arm over me. His tactic...love me awake. I can assure you, on those mornings, I woke up with a good attitude! My daddy was never an overly affectionate guy, but he wouldn't shy away from a hug either. If I hugged him, he was gonna hug me back for as long as I needed huggin'...and sometimes I needed a good long hug or a side to snuggle up against. He never minded. I could think of a thousand more ways my daddy spoke his love to me. He played games with me. He helped my with homework. He gave me advice. He would sit with me and just talk. He prayed for me. All that I've mentioned and those things left unsaid, they all just really point to one thing...security. I grew up as secure in my daddy's love as a girl could get. My sweet daddy, like a big ol' warm blanket, covered me and nurtured me into womanhood. He showed me first what a heart of gold looked like so that later in life, I knew exactly what to look for. All I can say is, you did it all right! In my estimation, you have been and are the best kind of daddy a girl could ask for. When I had questions, you never turned me away. When I had fears, you helped me to see the truth. When you saw a gift in me, you pointed it out. You have spoken to the tiny seeds in my heart and I know you and Mom have asked the Lord to make all my dreams blossom. I feel and know your love each time you're around. Simply let me say this, I am forever thankful to be called your daughter! What a privilege it is to call YOU, Dad.